UPDATED: Sun., Dec. 17, 2017, 9:53 p.m.
OAKLAND, Calif. – Dallas kept its playoff hopes alive by the slimmest of margins after Dak Prescott converted a fourth-down sneak by the width of an index card to set up Dan Bailey’s go-ahead 19-yard field goal, and Derek Carr fumbled the ball inches from the goal line with 31 seconds left to give the Cowboys a 20-17 victory over the Oakland Raiders on Sunday night. The first key play came when Cowboys coach Jason Garrett decided to go for it on fourth-and-1 from his own 39 with about five minutes left in a tie game. Prescott ran into a pile that took officials time to untangle. Referee Gene Steratore then called for the chains to come out, but even that wasn’t enough. He then tried to slide what appeared to be an index card between the tip of the ball and the end of the chain. When the card didn’t slide through, Steratore gave Dallas (8-6) a first down. Prescott then hit Dez Bryant with a 40-yard pass that set up Bailey’s short kick with 1:44 to play that gave the Cowboys the lead. But the game was far from over. The Raiders (6-8) got a gift when Jourdan Lewis committed a 43-yard pass interference penalty on a fourth-and-10 from their own 30. 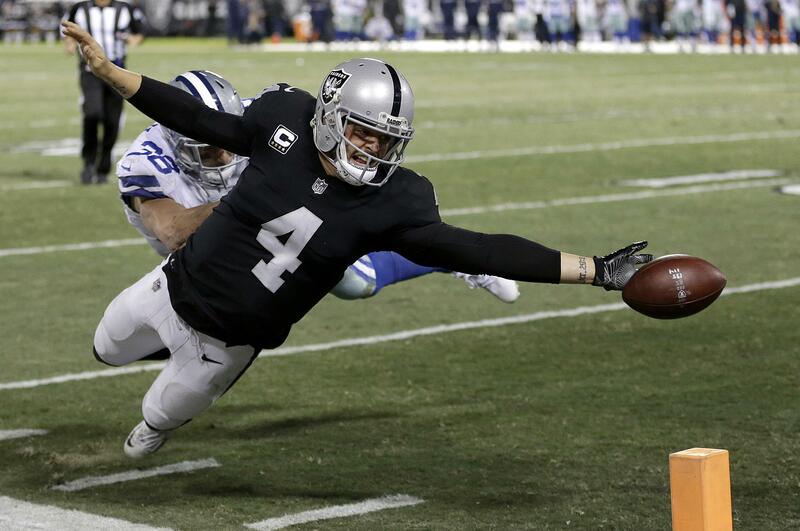 Carr then scrambled on third-and-3 from the 8 and reached out for the end zone. But the ball came loose before crossing the goal line and went out of the end zone for a touchback that all but ended Oakland’s playoff hopes. The Raiders are tied for ninth in the AFC. Dallas is in a three-way tie for seventh place in the NFC, a half-game behind Atlanta for the final playoff spot. The Falcons beat the Cowboys head-to-head. The Cowboys got their third straight win without suspended star running back Ezekiel Elliott, who returns from a six-game suspension next week. But Dallas’ three straight losses at the start of the suspension created a hole the team is still trying to escape. JACKSONVILLE, Fla. – The Jacksonville Jaguars are returning to the playoffs for the first time in a decade thanks to a 45-7 drubbing of rival Houston. Once the NFL’s poster child for futility and a punchline for potential relocation, the Jaguars (10-4) are now one of the league’s top turnaround stories. Blake Bortles threw three touchdowns passes, including two to a reserve receiver who slept in his car earlier this season. The Jaguars won for the seventh time in eight games to clinch a postseason berth for the first time since 2007. The Jaguars were an NFL-worst 22-74 over the previous six years, more a laughingstock than a postseason contender. PITTSBURGH – Tom Brady fed Rob Gronkowski repeatedly to set up Dion Lewis’ go-ahead 8-yard touchdown with 56 seconds remaining and Ben Roethlisberger was intercepted in the end zone with 5 seconds left. The Patriots (11-3) gained the inside track for home-field advantage in the AFC playoffs by ending Pittsburgh’s eight-game winning streak. Brady threw for 298 yards with two touchdowns and an interception. Gronkowski, fresh off a one-game suspension, finished with nine receptions for 168 yards, including four on the winning drive. The Steelers (11-3), who played most of the game without injured star wide receiver Antonio Brown, appeared to take the lead when Roethlisberger connected with tight end Jesse James for a 10-yard touchdown with 28 seconds to left. The play was overturned on review, with official Tony Corrente saying the ball did not “survive” the completion of the catch. Brown, the NFL’s leading receiver, went to a hospital having his left calf injury examined. SEATTLE – Todd Gurley rushed for 152 yards and scored four total touchdowns in just 2 1/2 quarters, and the Rams moved to the cusp of their first division title since 2003. The matchup to determine first place in the NFC West was completely one-sided. Los Angeles (10-4) was dominant, embarrassing Seattle into the worst loss during Pete Carroll’s eight seasons in charge. The Rams don’t have the division wrapped up, but have a two-game lead with two weeks to play. A win against either Tennessee or San Francisco is enough for their first division title in 14 years. SANTA CLARA, Calif. – Jimmy Garoppolo led one final scoring drive in the closing seconds to cap a fantastic first home start and Robbie Gould kicked a winning 45-yard field goal as time expired. Garoppolo threw for a career-high 381 yards and a touchdown to give the 49ers (4-10) a three-game winning streak in a lost season. And Tom Brady’s former backup showed he could do it at home as well as on the road – and against a playoff contender, no less – outdueling Marcus Mariota down the stretch as the teams traded field goals. MINNEAPOLIS – Eric Kendricks had an interception return for a touchdown, Case Keenum passed for 236 yards and two scores, and the Vikings clinched the NFC North over the depleted and disinterested Bengals. Running backs Latavius Murray and Jerick McKinnon combined for 37 touches and 242 yards from scrimmage for the Vikings (11-3), who were given quite the reprieve on the schedule a week after their eight-game winning streak ended at Carolina in the last of three consecutive road trips. They were never challenged the Bengals (5-9), missing more than half of the starting defense to injuries, and met with a morning report by ESPN that head coach Marvin Lewis will not return next season . The game went so smoothly that Teddy Bridgewater even made his grand entrance, his first live action in 16 months since a massive knee injury. Bridgewater’s first pass was intercepted, a high throw that bounced off McKinnon’s hands and into the arms of strong safety Shawn Williams deep in Vikings territory. That set up a short touchdown run by Giovani Bernard to keep the Bengals from being shut out for a second time this year. Lewis who lost to a former assistant (Mike Zimmer) for the first time in eight matchups. Zimmer was the defensive coordinator for the Bengals from 2008-13. EAST RUTHERFORD, N.J. – Nick Foles threw four touchdown passes in his first start replacing the injured Carson Wentz, and the Eagles secured a first-round playoff bye. Manning finished 37 of 57 and hit Tavarres King on two touchdowns and Sterling Shepard on one. It was Manning’s ninth career 400-yard game and his first since last season. CHARLOTTE, N.C. – Cam Newton threw for 242 yards and four touchdowns, and the Panthers spoiled Aaron Rodgers’ return from a broken collarbone. Rodgers, making his first appearance since Oct. 15, threw for 290 yards with three touchdowns, but was intercepted three times as the Packers’ playoff hopes took a critical blow. NEW ORLEANS – Mark Ingram ran for two touchdowns and gained 151 yards from scrimmage, including a late 50-yard TD run, and the Saints overcame three turnovers. Alvin Kamara turned a short catch into a 10-yard TD in his return from a concussion that knocked him out of the Saints’ loss at Atlanta a week earlier. Bryce Petty made his first start at quarterback this season for the Jets (5-9), who were eliminated from playoff contention. Petty completed 19 of 39 passes for 179 yards and a touchdown, but was intercepted twice – once on a tipped pass and once on a long, inconsequential throw as the game ended. His 2-yard touchdown pass to rookie Elijah McGuire cut New Orleans’ lead to 24-19 with 1:51 left. But the Jets’ onside kick failed and Ingram broke loose for his long score while the Saints were trying to run down the clock. CLEVELAND – Joe Flacco threw a touchdown pass, ran for a score and beat Cleveland again as the Ravens stayed on track for the AFC playoffs. With victories at home over Indianapolis and Cincinnati in its last two games, the Ravens will return to the postseason after a two-year absence. The Browns are two losses from becoming the NFL’s second 0-16 team. The Browns (0-14) went 0-8 at home – 0-7 in Cleveland, 0-1 in London – for the second time and must win at either Chicago or Pittsburgh to avoid joining the 2008 Detroit Lions in the notorious 0-16 club. Last season, the Browns avoided infamy by winning their final home game and finishing 1-15. ORCHARD PARK, N.Y. – LeSean McCoy scored twice and surpassed 10,000 career yards rushing, while helping the Bills stay in the thick of the AFC playoff hunt. Tyrod Taylor also scored on a 9-yard touchdown run and Shareece Wright and Jordan Poyer intercepted Miami’s Jay Cutler on consecutive drives to start the second half. Buffalo never trailed. Rookie Tre’Davious White sealed the win by intercepting Cutler with 28 seconds remaining – and one play after Miami punter Matt Haack recovered an onside kick at Miami’s 37. The Bills have won three of four and improved to 8-6 to match the team’s best record through 14 games during Buffalo’s 17-year playoff drought – the longest active streak in North America’s four major professional sports. The Bills were 8-6 in both 2004 and 2014, but missed the playoffs with 9-7 finishes. LANDOVER, Md. – Anthony Lanier sacked Blaine Gabbert and forced a fumble that Preston Smith recovered and the Redskins held on to beat the Cardinals in a comedy of errors for each team. Smith also intercepted Gabbert and Lanier batted down three passes and had two sacks as they gave the Redskins (6-8) a glimpse of their potential as significant pieces of the defense for years to come. Washington’s Kirk Cousins was 18 of 26 for 196 yards with touchdown passes to Jamison Crowder and new running back Kapri Bibbs. The Redskins were booed at times in the second half by fans in the announced crowd of 71,026. Published: Dec. 17, 2017, 9:36 p.m. Updated: Dec. 17, 2017, 9:53 p.m.